The contestants in the Saudi Arabian Miss Camel pageant must exhibit an “untouched natural beauty.” With about 50,000 entrants, that’s a lot of natural camel prancing down the runway. The Washington Post reports that this year’s King Abdulaziz camel festival will be running through April 15 in the desert of Rimah, continuing a tradition that began in 1999 when a group of local Bedouins decided they wanted to pick out the fairest camel of them all from the rambling herd. The Saudi royal family was into it, and the festival has since grown enormously. The camels range from the al-Wadah white camel and the al-Majahateer dark camel to the al-Homor reddish, brown camel. 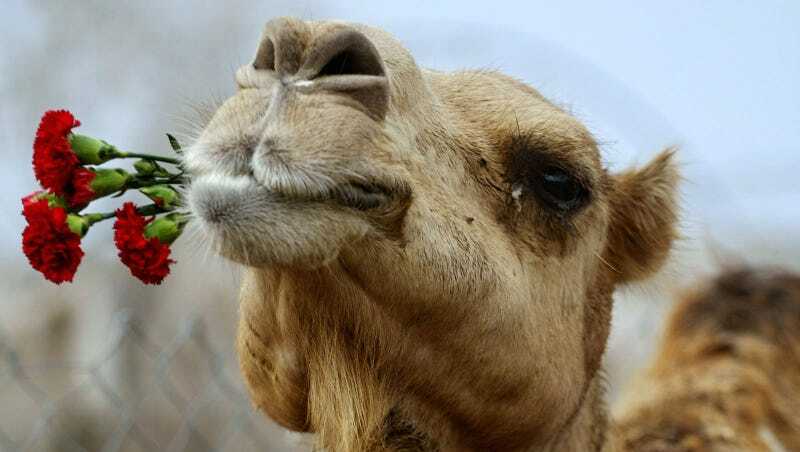 The most beautiful among the thousands of competitors are judged on various features, including the size of the camel’s head, whether the lips cover its teeth, the length of the neck, the roundness, height and placement of the hump, the size of its eyes, how long the lashes are, how the nose droops and whether the ears stand back. Camels must also be purebred and residents of Saudi Arabia. Elitism? At a beauty pageant? Al-Arabiya reports that there are about 115 million Saudi riyals (about $30.66 million USD) in prize money to be distributed among the winners, and more than 10,000 visas have been issued so folks from around the world can attend the event. You don’t just have to be, or have, a camel to enjoy it. There is award money for best poem (presumably about camels) and for best “abstract painting of a camel.” After weeks of picking apart the real thing, a cubist camel gives attendees a refreshing new look at a complicated subject.